Today I baked the easiest ever bread. I’d read about no-knead bread making and thought it sounded too good to be true – and it is! The bread needs to prove for up to 24 hours ( which had been slightly off-putting as I’m the ‘instant gratification’ type) so you need to start a day before you intend to bake. I started these loaves yesterday morning. I followed the ‘traditional’ no-knead recipe first. It requires the bread to be baked in a very hot oven inside a heavy pan, to trap steam. The recipe I used was from steamykitchen.com, the author demonstrates the ease of this method by showing photos of her 4 year old son making the bread, it really is that easy, and her photos show each stage of the process, so worth reading, especially as I didn’t take any photos :(. The recipe used was 3 cups of flour, 1/4 tsp instant yeast, 1 tsp salt and 1.5 cups of warm water (body temperature). Put all of the dry ingredients into a large mixing bowl and add the water. Stir all together with a wooden spoon, cover with cling film and leave in a warm place for 12 to 18 hours. The dough was quite dry, so I had to add approximately another half cup of water to get all the flour incorporated, but the whole process took less than 5 minutes. This morning the dough had doubled in size and was quite moist, as it should be. I tipped it out onto a floured work surface and with wet hands, flattened it out and then folded the corners into the middle (not sure why this step is needed) made it into a round ball and then put it back in the bowl to prove again. The recipe said to put the dough onto a floured tea towel or baking paper first, to make it easier to take out of the bowl once proved, but I didn’t do that, and not sure it made any difference. The dough needs to prove again for about 2 hours. 30 minutes before the bread finishes proving, put the heavy pan with lid in the oven on 450F/230C, make sure the pan doesn’t have plastic handles or lid, as they will melt. When the dough has rested for 2 hours, tip it into the hot pan and bake for 30 minutes with the lid on, and another 15-20 minutes with the lid off. When the bread is fully cooked it should sound hollow when tapped. Turn onto a rack and allow to cool before eating (the hardest part because it smells so good)! 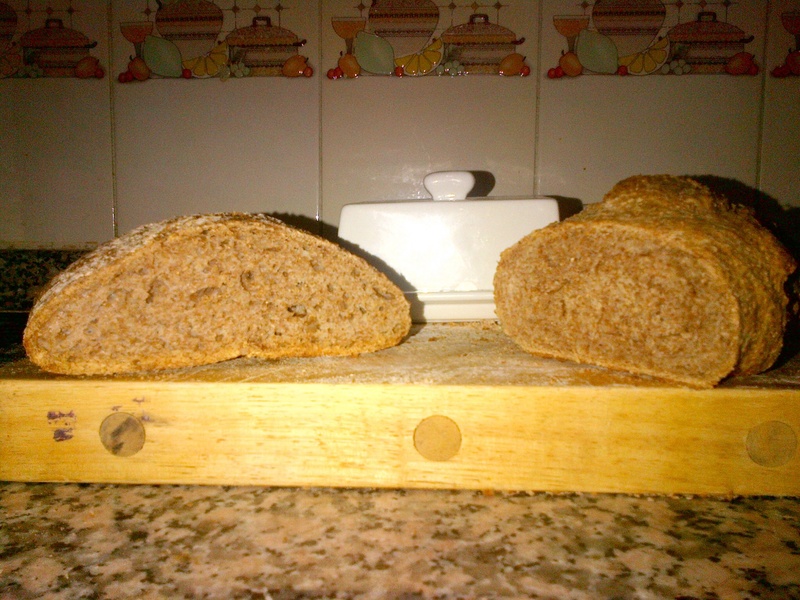 Verdict: the bread (on the left in the photos) was quite heavy and dense, very rustic ( and I’ll tell you why a bit later). I actually didn’t wait for it to cool right down before eating and it was still a bit ‘doughy’, however I had another slice later and it was fine, but still heavy. The crust was crunchy and lovely. For my 2nd loaf, also started yesterday, I followed a recipe on Jezebel.com. I like this site, the author is a girl who likes to simplify the simplistic even further! She’s made easy bread making even easier. This recipe calls for refrigeration of the dough, the rationale being that the slower fermentation of the yeast adds to the flavour. The dough can be left in the fridge for up to 2 weeks, so you can make up a big batch in a plastic container and take some as you need it, and you re-use the container again and again without washing it – the left over dough acting as a starter/improver for the next batch. Sounds like a winner to me! Put the water, salt and yeast into a plastic container, stir and wait a few minutes for the yeast to dissolve and start bubbling. Pour in the flour and mix with a spoon. This bit was quite strenuous due to the quantity of ingredients. The mixture was quite stiff again so I needed to add an additional 1/2 cup of water to incorporate all the flour. Loosely put the lid on and put in a warm place to prove. After 1-2 hours the mixture should have doubled in size ( mine hadn’t) put the lid on and put in the fridge for at least 12 hours, and up to 2 weeks. Verdict: I was worried about this loaf, it felt heavier and was smaller than loaf 1 and it didn’t sound hollow, but the bottom was beginning to get a little too dark so I needed to take it out of the oven. I expected it to taste denser and heavier, and if I’m totally honest, I thought I’d be feeding it to the chickens this afternoon. 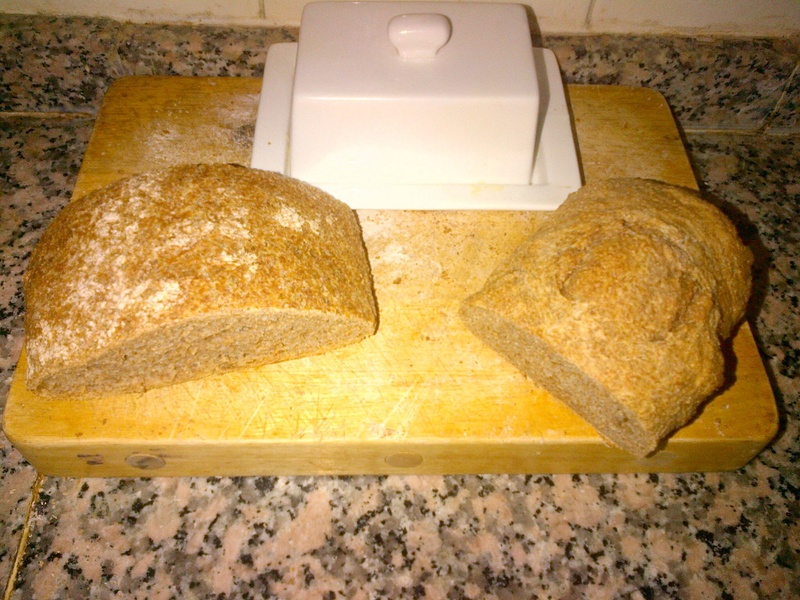 So was pleasantly surprised that it is both lighter in texture and tastier than loaf 1! It’s delicious. NB after researching why loaf 1 was too dense, I discovered that the recipes I’d been using called for all purpose (white) flour and I’d used 100% wholemeal flour which not only produces a denser loaf but also requires more water! However, I think the refrigeration method overcomes the density issue and I can’t wait to see if this improves further after a few more days in the fridge. 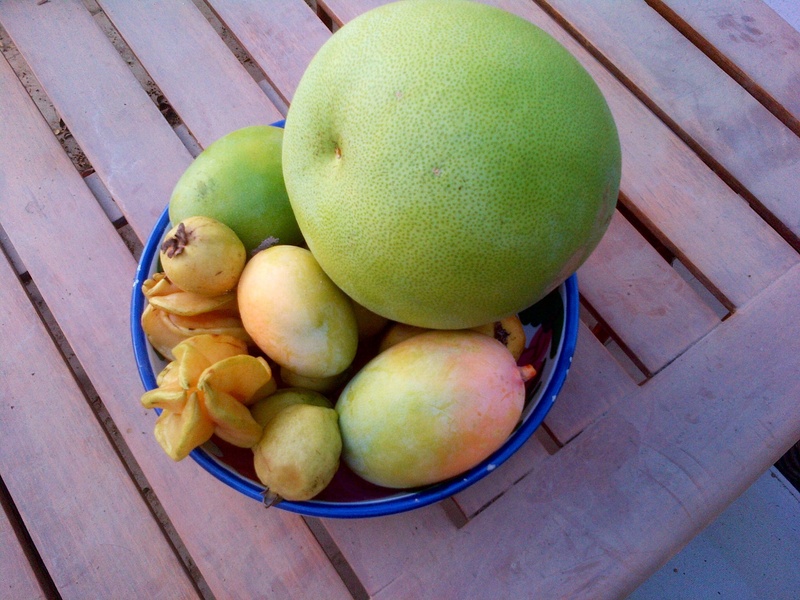 Pomelo, mangoes, star fruit and guavas – all picked this morning, unfortunately not from our garden but a gift from a neighbour. I’m amazed at the types of fruit and veg that grow in this extreme summer heat, it’s still in the 40’s during the day. Our papayas and sweet limes are still going strong, as are the sweet potatoes. 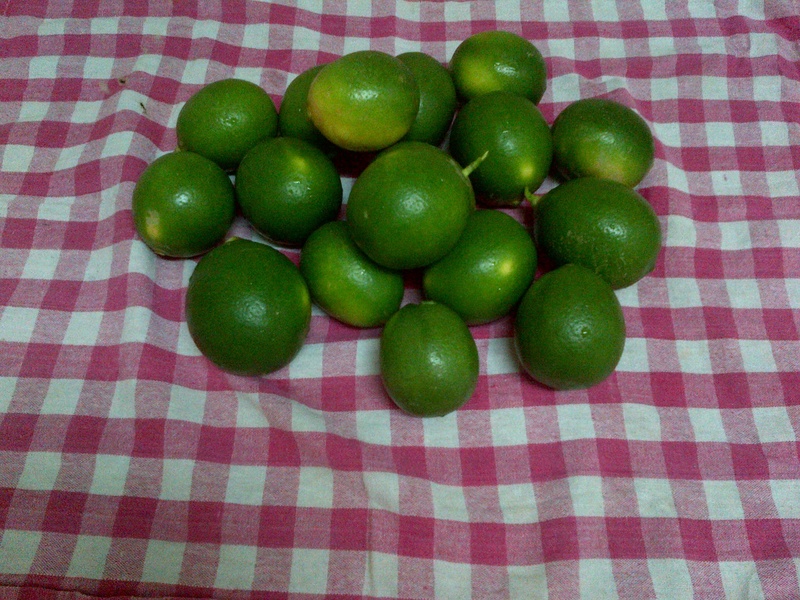 I first discovered sweet limes when we lived in India. They have a sweet/sour flavour, almost a cross between a lime and an orange, and the juice is sweet enough to drink without the addition of sugar. They also make fantastic marmalade and pickle. So for my sweet lime marmalade I followed the standard marmalade making procedure, but only used half as much sugar as usual. The end result is a murky olive green, nothing like the day-glo lime green of the commercially made product, but it tastes so much better! It’s surprisingly tart (considering the fresh fruit isn’t) and actually tastes of real limes – I love it. Off to pick some more now to make a hot pickle to go with curry. As I’m not eating or drinking dairy products right now, I wanted to take advantage of the benefits of my newly acquired kefir grains without having to rely on milk kefir. Kefir is an ancient probiotic cultured beverage, full of good bacteria and good yeasts and a great immune system booster. I’d read conflicting advice on t’internet on whether it was possible to convert milk kefir grains to make water kefir, but thought I’d give it a go. The method seemed fairly simple, 2 cups spring water, 3/4 cups of raw sugar or cane juice ( we grow our own organic sugar cane) and some dried fruit. 10 dried cranberries were recommended, as the favourite fruit of kefir grains, but as I didn’t have any I used raisins. Leave on the kitchen counter for 48 hours. Shake the jar several times a day to mix up the contents. Repeat 3 times and on the fourth fermentation, save the fermented water, divide between 2 sterilised flip top bottles and fill those bottles to 2/3 rds full with fresh juice of your choice (kefir grains really like grape juice apparently), leaving enough space for the carbonisation process. Place in a warm dark cupboard for 24 hours and voila! A healthy fizzy drink. It needs to be refrigerated after 24 hours in order to slow down the carbonation process, as the bottles can explode. So I followed the process above….and nothing happened. No fizz, no slightly yeasty smell, nothing. I changed the sugar water mix after 48 hours and thought I’d try some dates instead of raisins, and I’m happy to report that within 24 hours that jar was fizzing! Kefir grains really like dates, thank goodness we have abundant supply of them. I saved the water from the fourth batch, as instructed above, filling 2 bottles with cranberry juice (homemade but no additional sugar) and 2 bottles with white grape juice. I left them to carbonate for 48 hours, as I’d stretched the fermented water between 4 bottles and assumed they’d take longer to carbonate – wrong! I opened one of the grape juice bottles after it had been in the fridge for about 10 hours, and it blew the stopper off the flip top bottle and sprayed the kitchen, ( did I mention that these bottles should be opened over the kitchen sink). Anyway, the kefir water tasted amazing, although a little sweet for me. I opened the cranberry kefir water, and got a loud pop, rather than an explosion. It was nice but far too tart, so I mixed them both together and now have a very, very nice cranberry flavoured fizzy, but healthy drink. With a shot of vodka, this would make a fantastic cosmopolitan 🙂 – but as I’m booze free currently, will make do with my ‘virgin’ cosmos! I’ve been fermenting batches of milk kefir for 3 weeks now. The first attempts were revolting. I’d heard that kefir was an acquired taste, but how anyone could drink that frothy yeast brew was beyond me. I was fermenting on a shelf in the kitchen for the recommended 48 hours. Then it occurred to me that our kitchen was probably too hot overnight once the aircon was switched off ( I hadn’t noticed as Tom gets up at 5 am to take the dogs to the beach and turns the aircon on, so the kitchen is already cool when I get up). I tried fermenting for 24 hours and it was better, but not great. My dilemma was- as I’m not eating any dairy right now, didn’t want to make too much of the stuff, so fermenting a new batch a day was out of the question. So now I have a new method, which I’m sure kefir aficionados will not approve of. I ferment the kefir overnight in the kitchen, and then put it in the fridge as soon as I get up. I left the first batch in the fridge for 5 days and it tasted delicious, thick and creamy and slightly tangy. I left the 2nd batch for 7 days and tried it this evening, as good as the first, but with a slight yeasty aroma. I’m not drinking it, just taste testing for now, but the dogs absolutely love it – they dance around me when I take the jar out of the fridge! I have another batch going now, and will leave it for 6 days, and then will try a double ferment ( adding organic lemon or orange slices and leave it out for 24 hours), which allegedly improves the flavour and the nutrients. My scoby (kefir grains) has doubled in size in 3 weeks! Busy weekend, homemade lemongrass and ginger soap with a copper mica topping ( bit OTT but smells amazing); berry flavoured Shea butter lip balm; home- made ketchup, used the last of the Roma tomatoes, and bone broth – all before lunch! i have milk kefir fermenting ( thanks to Aisha for the scoby) and have been converting some of the grains to water kefir over the last week or so. I now have 2 bottles of cranberry kefir brewing, and 2 bottles of grape. Will post separately on the process and the results. 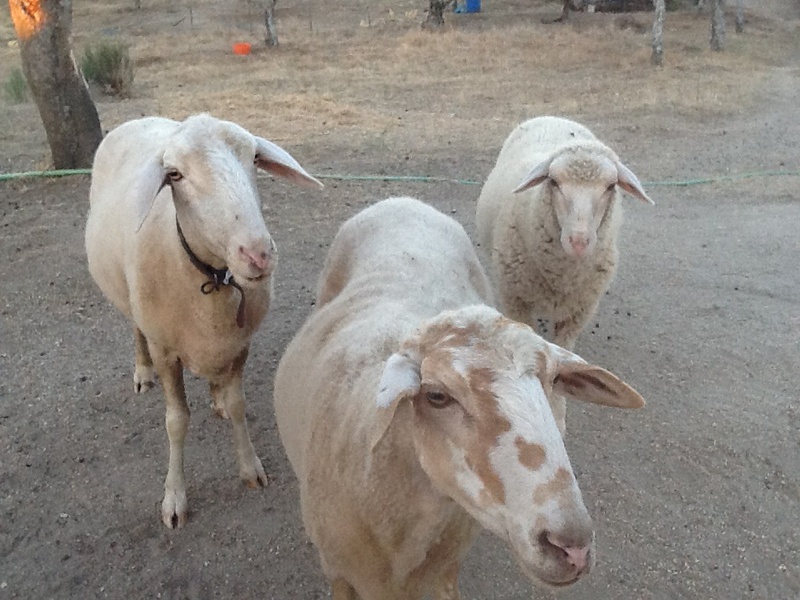 Ever wondered what to do with the rind left over from melons? They take so long to breakdown in the compost, even the chickens leave them alone after the flesh has been pecked off. 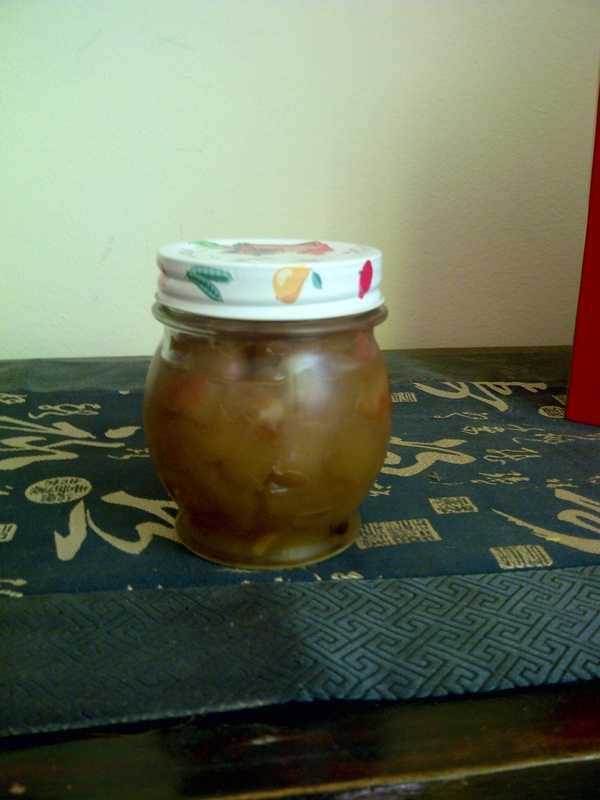 I found this great recipe for pickled watermelon rind so thought I’d give it a go. It’s not paleo, as it contains sugar, so I won’t be eating it but Tom might like it. The process is quite drawn out, but because there was only a little bit to do each day, it was actually easier than making pickles in one big batch from start to finish. Day 1- peel the watermelon rind and cut into 1/2 to 1 inch squares. I sliced my watermelon she’ll into 1 inch strips, which made it easy to strip of the skin and the flesh with a vegetable pearler, took about half an hour. Make a brine with the salt and water and soak the rinds overnight in the fridge. Day 2- drain and rinse the rinds. 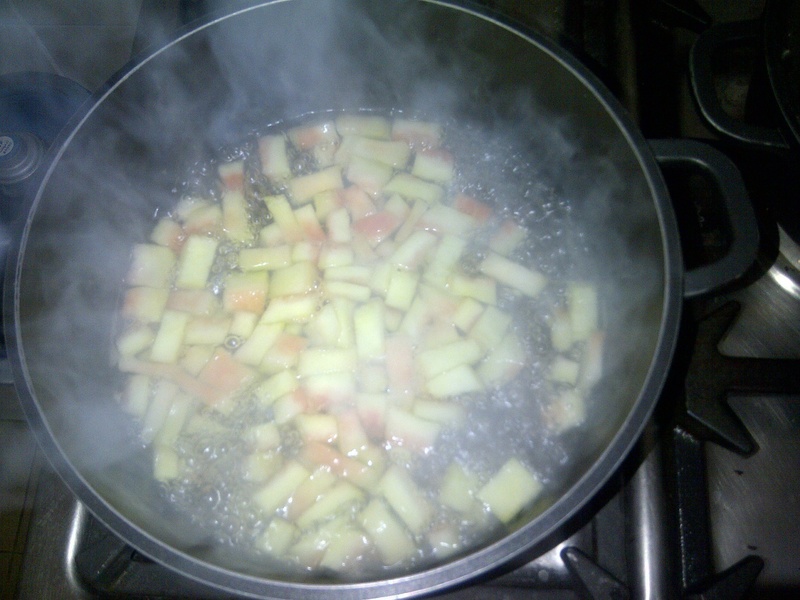 Put in a large pan with just enough water to cover, bring to the boil and simmer gently until the rinds are fork soft, about 15 mins. In another pan pan mix the remaining ingredients, except the lemon, bring to the boil and simmer for 5 minutes. Pour over the rinds and when cool, add the lemon slices and put back in the fridge overnight. I did have a sneaky taste, and it’s lovely, the rinds have the texture of ripe pears in a tangy syrup. The combination of spices make this smell and taste quite festive, and I imagine it will taste great with the cold meats and cheeses we usually eat around Christmas – if it lasts that long!